Diving on the 1660 wreck of Resande Mannen. In the foreground are a bronze sheave and a box with square, glass medicine bottles, nestled between two deck beams. Image: Jens Lindström May 2016. In 2003 underwater sonar was being used to locate a Swedish reconnaissance plane that had been shot down in the Baltic Sea in 1952 during the cold war. They came across, as archaeologists call them, an ‘anomaly’ that indicated a possible shipwreck. At 130 metres depth, an ROV (Remotely Operated Vehicle) was sent down to investigate. 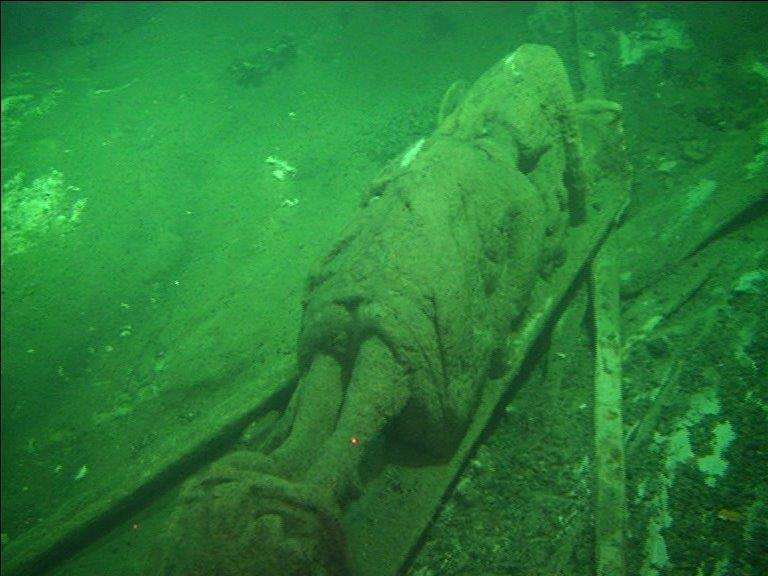 To the surprise of all, they saw a 17th century ship sitting upright on the bottom of the sea floor, quite intact, looking like it was ready to be crewed and set sail again. In fact it, was so complete that spars and rigging lying on the deck could tell them the last sail settings – and hence manoeuvre – before the ship sank. It was such an eerie sight that archaeologists instantly named it ‘The Ghost Ship’. This 3D reconstruction image shows the Ghost Ship sitting upright on the sea bed. The fore and mainmasts are still standing, while the mizzen fell towards the bow in the process of wrecking, probably when the ship hit the sea-bed. Image: Marin Mätteknik. Most people know of the iconic Swedish shipwreck the Vasa. Lifted from the sea floor in 1961 it now sits in its own incredibly popular museum. But there is much more to Swedish maritime archaeology than Vasa. The Baltic Sea is littered with Swedish and other nations’ ships – in fact it is one of the best locations in the world for ship archaeology. Most marine organisms that attack wood, including the infamous shipworm Teredo navalis, are absent from this cold, brackish sea. The 2003 ROV inspection of the Ghost Ship showed it to be a merchant ship from the mid-17th century, revealing typical Dutch shipbuilding characteristics from this period. An almost intact ship is a different kind of challenge for maritime archaeologists. 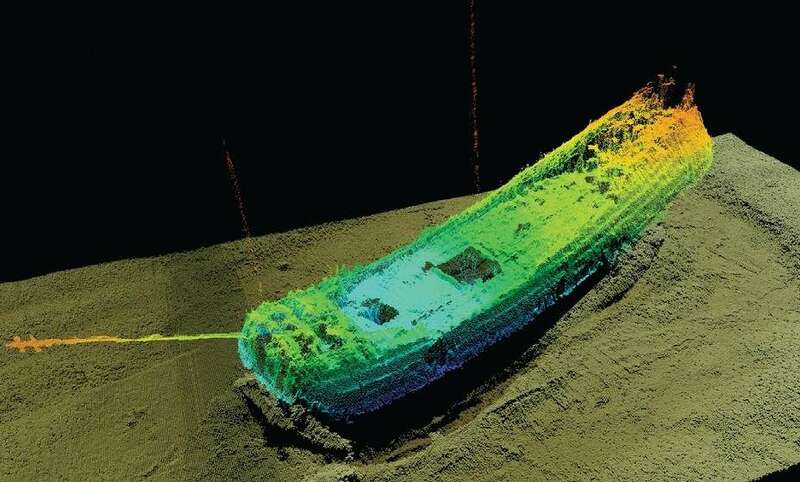 A multi-beam echosounder was used to penetrate the upper deck and the holds, to gather accurate measurements for a 3D reconstruction of the ship. This map revealed the contents of the vessel, including rigging, decorative work, sails, a hearth place, sailors’ chests, and many other artefacts. The Ghost Ship has the characteristic pear-shaped stern recognizable from 17th-century depictions of Dutch fluyts (fluits). The rudder head is decorated with three flowers, a motif traditional for Holland. The stern was flanked by two life-size sculptures depicting Dutch mid-17th century merchants in fashionable clothing, with bulging money-pouches on their belts. These have, perhaps somewhat ironically, fallen off and were found on the sea-floor next to the wreck. Carved flowers on top of the rudder. Image: Marin Mätteknik/Deep Sea productions. One of these ‘corner men’ (hoekman in Dutch) was salvaged in May 2010 by an ROV fitted with a mechanical claw. A brief inspection revealed red paint on the hat and black on the merchant’s coat and it has now been sent to Holland for conservation and further paint analysis. One of the fallen merchants from the Ghost Ship. Image: Sjöhistoriska Museet. The area on the transom between the two hoekmen, originally covered with horizontal panelling, was where the ship’s name should have been. But at this time, when most people could not write their own names let alone read, ships’ names were often added by using symbols – allegoric sculptures or ornaments. Many names were probably influenced by their ability to be easily depicted and widely understood in symbols, such as Half Moon, Virgin Mary, The Rose, or Prophet Abraham. When the ROV surveyed the area abaft the ship, a sculpted piece of wood lying among other timbers came into view. It has been identified as the body of a swan, carved in deep relief. The original name of the Ghost Ship probably was the Swan, or at least the word ‘swan’ was part of the name. An ROV peeping through the windows in the stern. Image: Marin Mätteknik/Deep Sea Productions. The eerie beauty of the Ghost Ship’s preservation makes it possible to reconstruct what the crew were doing just before the ship sank. The spars and yards have fallen down directly below their original positions as the cordage holding the rig together rotted away. The position of the rigging-parts thus indicates the final trim of the sails – they were set to ‘heave to’, or to slow the ship down. The arrangement of fallen spars on the Ghost Ship can be clearly seen. Image: Niklas Eriksson. While the reason for ‘heaving-to’ may have been to concentrate on desperately operating the pumps or even to get into the ship’s boats, the main cause of the sinking, remains unknown. Still, the Ghost Ship is an exceptional maritime archaeological find, and in terms of its state of preservation has few equals in the world. The Baltic has been a busy sea-route for a very long time. Prehistoric vessels traded around the sea that has been a central highway between the historical cultures of modern day Denmark, Germany, Poland, Denmark, Lithuania, Latvia, Estonia, Finland, Russia and Sweden. Baltic trade also had a special importance for the Dutch during their period of great maritime expansion, and upwards of 2,000 trading-ships would sail into the Baltic each year during the mid-17th Century. Salt and manufactured goods were brought to the north, raw materials such as iron, limestone and timber were carried from the coasts of the Baltic to Amsterdam and other towns in the Netherlands. HMS Svärdet was sunk during the 1676 Battle of Öland. This profile drawing shows the cannon still peering out from the gun ports, dramatically capturing the ship’s last moments in action. Image: Niklas Eriksson. 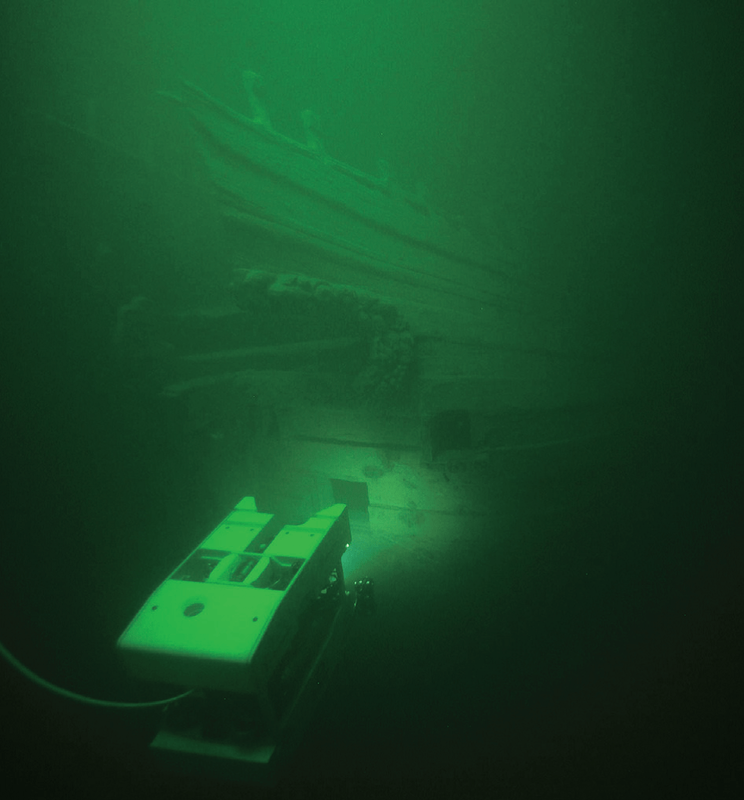 In 2003 a well-preserved shipwreck was found north of Dalarö in the Stockholm archipelago. In 2007 and 2008 the site was surveyed jointly by archaeologists from the Swedish National Maritime Museum, Södertörn University and the University of Southampton. It was named the Edesö Wreck, and appears to have been a small man-of-war, built and probably sunk in the late 17th century. It was possibly built in England, or at least in the English fashion of that time. The original name of the ship, as well as the precise history of its demise, are unknown. The Kronan was the largest ship in King Charles XI’s royal fleet in the 1670s, and one of the largest in the world at the time during Sweden’s period as a significant European power. Kronan exploded and sank in 1676 in a battle off Öland, an island off the Swedish southern coast. The battle was fought in bad weather and apparently Kronan turned too hard with too much sail and began to founder. When the powder magazine exploded, most of the bow structure was lost, and King Charles’ prestigious flagship quickly sank. Around 800 men died and over one hundred heavy guns were lost. 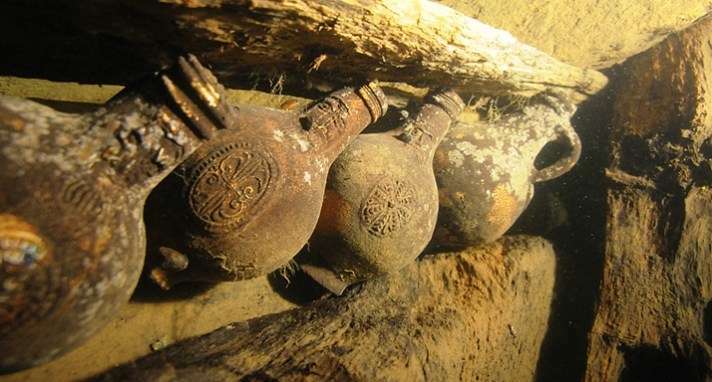 The wreck was discovered in 1980, and since then more than 30,000 items have been retrieved from the site, even including some books – as well as Sweden’s largest-ever horde of gold coins. 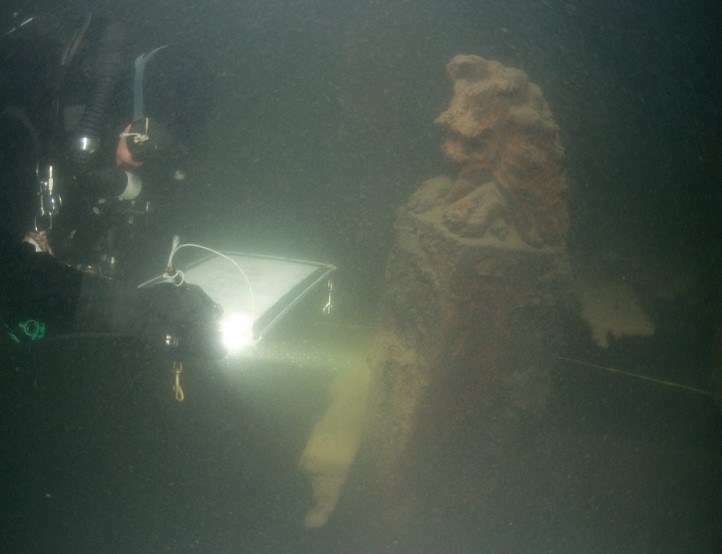 A diver finds a carved lion’s head decoration. The ‘name-carving’ on the transom has not yet been found, hence the ‘Lion’ is a temporary name for the vessel. Image: Jonas Ryden Deep Sea Productions. 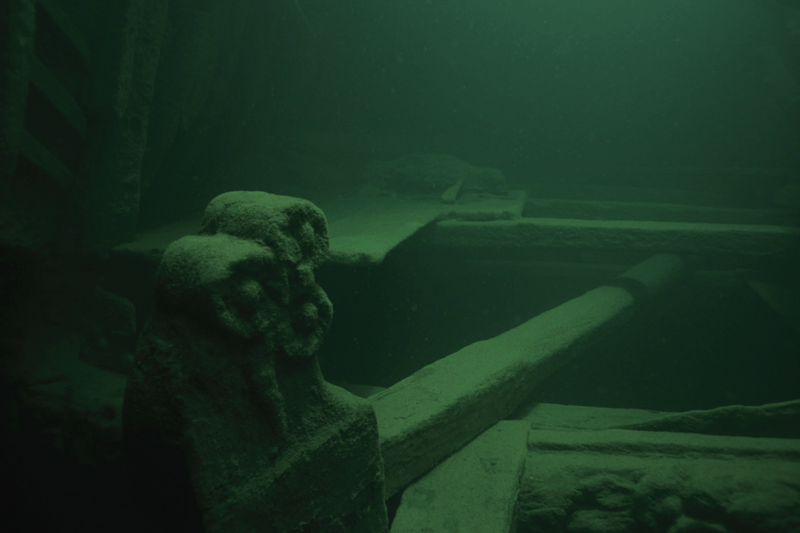 Other significant wrecks near Stockholm include the 17th century Dutch fluit Lion and the wreck of the Mars – the huge flagship of the Swedish navy that was sunk in battle in 1564 and rumoured to be cursed as its guns were supposed to have been made from melted-down church bells. Perhaps the most intriguing Baltic wreck was the focus of a long hunt by divers – the so-called ‘treasure ship’ Resande Mannen. The evocatively named vessel, (Travelling Man in English) went down in the winter of 1660 in the Kastbåden near Nynäshamn. While 37 people died, 25 survived the deadly cold waters, many clinging to the top masts. Resande Mannen was a small armed ship carrying the Swedish privy council’s Count Carl Christoffer von Schlippenbach to Poland for peace negotiations. It had long been rumoured he was carrying a large amount of money for political bribes, as well as his own personal fortune. The timber frames of Resande Mannen lie like the rib cage of a skeleton on the sea floor. Image: Jonas Falck. 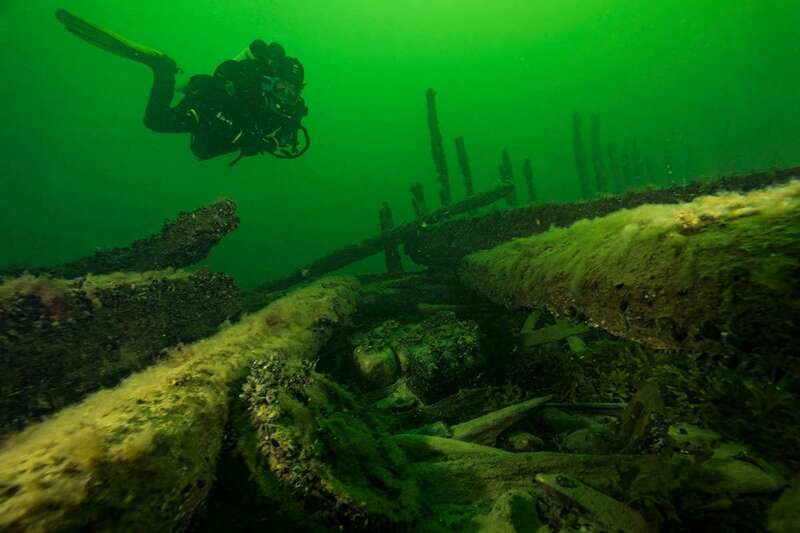 There are many, many other shipwrecks in the Baltic Sea. In fact, there are over 20,000 known wrecks, and archaeologists believe there may be 100,000 – which should keep them busy for some time to come. The collection of wrecks – well preserved in their own natural conservation lab, the Baltic – have been called ‘a museum under the sea’. Four bartmannkrus or ‘bearded man’ stoneware jugs from the Dalarö wreck. Image: Sjöhistoriska Museet. The wonderful state of preservation of wooden ships in the Baltic Sea has led to it being arguably the world’s best ship graveyard. 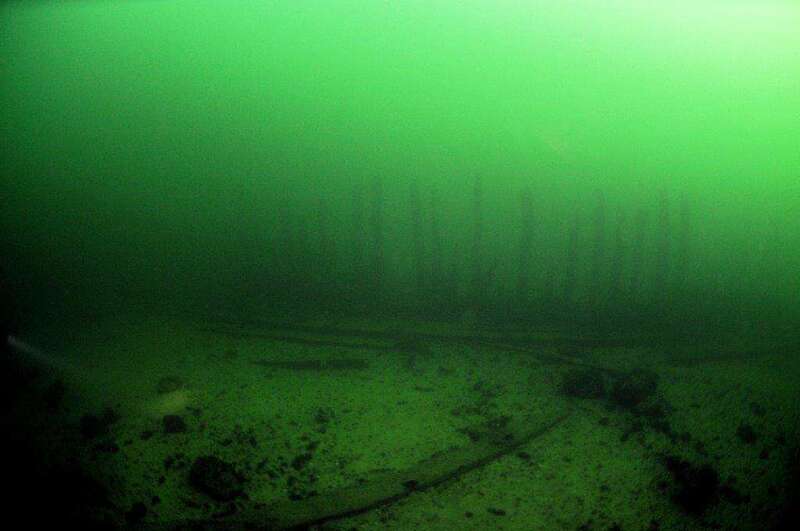 In the waters off Dalarö there are plans to create a ’diving park’ to allow guided recreational divers to visit the many wrecks clustered in the area. A new museum dedicated to these treasures of the Baltic is slated to open in Stockholm in the near future. As Niklas Eriksson, archaeologist at Södertörn University pointed out to me, although found in very different contexts, 17th century Dutch shipwrecks are something that both Swedish and Australian maritime archaeology have in common.